Male downy woodpecker feeding his son. This spring and summer the birds multiplied. My two resident couples of downy woodpeckers had at least two boys and a girl. It was fun watching the female downy showing the ropes to her daughter and the same with the male downy woodpeckers showing their sons where the suet could be found. 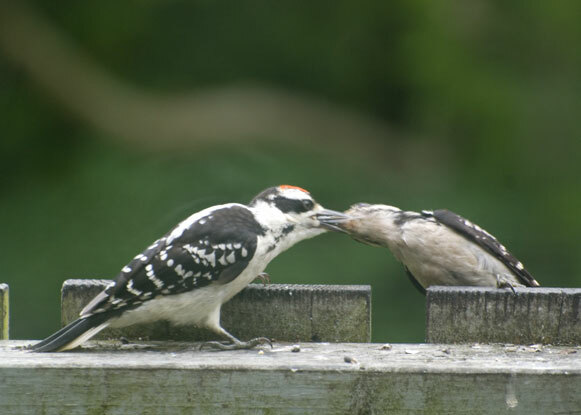 The red-bellied woodpeckers had a daughter this year. 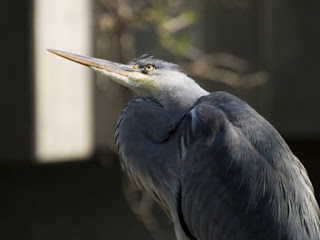 She is much bolder than her rather elusive mother and frequents the suet feeder more often and is more tolerant of my presence beyond the window. The grackles had loads of young and the starlings outdid themselves. I also had a pair of house sparrows nest on my deck. 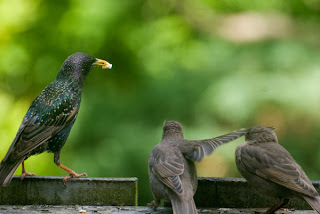 Like starlings, they are invasive species and probably should have been discouraged from nesting but, since the moment of conception happened on top of my suet feeder, I found myself enthralled with counting the days to the eggs hatched and then watching the parents work incessantly at feeding their young. Ma and Pa Sparrow raised two very healthy babies who are now happily ensconced in the flock of other young house sparrows in the area. 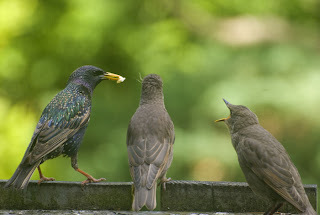 Young starlings noisily begging mom to be fed. I suppose that's one way to shut up your sibling. Also, the chipmunk and rabbit populations exploded this year. I've never seen so many chipmunks. I had several burrowing through my garden. 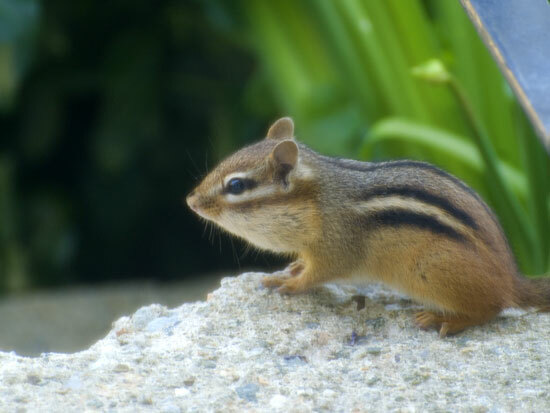 One very young chipmunk is very fond of sitting on my front steps. The young chipmunk fond of my porch steps.